Trends don’t just happen overnight. There’s usually a trendsetter involved, and it’s not a walk in the park. Coming up with business ideas to fill a hole in the market and turning it into a trailblazing business model that is followed by others is the kind of entrepreneurial success you want to aim for. Today I’m going to share with you one such story – our story. 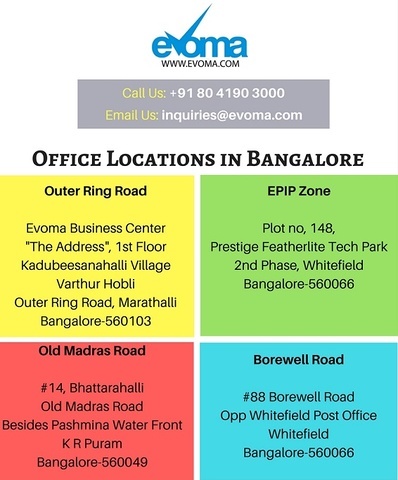 The idea of Evoma as a hybrid business incubation center and business hotel was conceptualized by Ashok Vohra in 2004, when Bangalore didn’t have any business centres or serviced offices. Today, every major industrial and commercial hub in Bengaluru has dozens of business centres, coworking spaces and other shared workspace options. This includes four Evoma business centres and one coworking space in key locations across the city. The timeline below is not just about Evoma, but is in effect a brief history of shared office space in Bengaluru. Read on to find out how this sector has grown into a big part of the Bangalore startup ecosystem, driving the city’s success and economic growth. 2002: How to come up with a business idea. In 2002, then British businessman Ashok Vohra started visiting India. The transcript below explains in his own words how he came up with a business idea that turned into Bangalore’s first business center and shared office space. In 2002, when I started visiting India, I noticed that commercial space to set up small, large – any type of business, was cumbersome, difficult and very expensive. There were large deposits involved, the fitouts cost a lot of money. And especially for organisations that actually wanted to come into India, to experiment whether India was a viable option or no – it’s all a large hindrance, apart from the obstacles imposed by bureaucracy and the government. So we felt…you know, created a place that was a cocoon that helped people come into India, get into a professional office environment, have no commitments in terms of leases or whatever, and neither would they be creating any legacies while they did their initial experimentation as to how they could do – if they could do business in India. 2005: How to expand and grow your business. We had made a small pilot about 15,000 square feet over in Whitefield. In 2005, we decided that what we would do is enhance on the pilot that we’d experimented with. And to complete the picture, we felt that creating a hybrid which also allows, apart from office and living space, and a training and meeting space, to be more apt, especially for those organisations that wanted to come into India. And that’s what we predominantly focused on. So we started construction on the Old Madras Road site. We weren’t particularly worried about the location, because we were going to make an integrated facility which did everything, including living, eating, etc. We built it on a 2-acre site, and we completed it in the middle of 2007. 2008: How to bulletproof your business from economic downturns. Unfortunately for us, 2008 was when the meltdown happened, and for the next 3-4 years, the business, generally, globally, wasn’t that good. However, when the world did start to come around, and green shoots started to appear, we noticed that the idea was again attractive. The only thing now was that the concept of serviced offices which had existed outside India for many years, was starting to become more prevalent in India itself with large organisations who had their business coming into India. So we slowly evolved and developed other sites, all within Bangalore. And perhaps a minor error – we should have expanded to other cities at that point in time. Well, 2-3 years ago, another phenomenon started to happen, which was the phenomena of coworking. Here again, the idea was to see how we could further reduce seat costs and provide spaces. Initially, this was all aimed at, what I would say, is the startup community, providing them cheap spaces so they didn’t have to work from home. This idea grew rapidly in India because of its economic structure, and it started to mushroom all over India. We felt that this wasn’t a space that we wanted to get into, because we’d gone down the serviced office route, as opposed to the coworking route. If I come up-to-date, say a year ago, we felt the whole business of serviced offices and coworking was going to morph again, where we started questioning exactly what was the serviced office and the coworking space achieving, and who was it aimed it? And then suddenly we realized that maybe this was “a” factor in an SME or startup – which was the cost factor, and a non-complicated factor as far as office space is concerned. What we started to look at, what did the industry – especially the SME, which is the largest sector in any country globally – what did they actually want? And that’s when we started to understand that maybe just providing a seat, be it coworking or a serviced office, was not exactly what the SME community was looking for. This is where we are today. We believe we have the next generation product, which is aimed predominantly at the SME community. We’re about to launch this product in the next 3-4 months. We believe it will be complimentary to all these people and the large organizations that are doing, be it coworking or serviced offices. But it’ll be more to do with synergizing the SME community, and providing them with actually what they need to do – which is how they need to maintain, sustain and grow their business.